"The prime minister and the Liberal backroom boys are trying to sneak this election past the Canadian people," says Joe Clark, national president of the Progressive Conservative Student Federation. According to Clark, it's an election that's neither needed nor wanted. But, Clark tells listeners to the CBC Radio program Cross Country Checkup, the 1965 election is important for young voters as Canada moves from "an old way of life to a new way." Clark, a 26-year-old Albertan, speaks forcefully and with conviction. He believes the Progressive Conservative party alone possesses the "innovating spirit" that will carry Canada into the future. He says even the party's critics have applauded its moves in agriculture, justice, trade and vocational training. Now the Tories are promising progress in education and urban development. "Canada can't afford another old-guard government," Clark says. • Charles Joseph Clark, known from early childhood as Joe, was born in High River, Alta., on June 5, 1939. His mother was a French teacher before her marriage and his father was publisher of the High River Times. • As a teenager, Clark was president of his high school's student council and edited the school newspaper. • In 1956, Clark's public-speaking skills won him a trip to Ottawa with the Rotary Club's Adventure in Citizenship project. 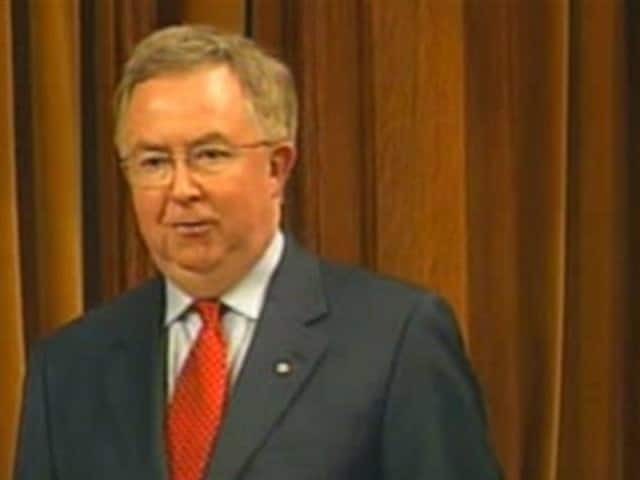 Clark was in the public gallery as Liberal Prime Minister Louis St-Laurent invoked closure to cut off further talk in the Pipeline Debate, inspiring Clark to tell his mother later that there was no democracy in Canada. • During the 1957 election campaign, Progressive Conservative Leader John Diefenbaker stopped in High River to make a speech. Clark was in the audience and shook hands with John Diefenbaker, whom he had met the year before in Ottawa. • After high school, Clark worked for a summer in the sports department at the Calgary Herald, then headed off to the University of Alberta in Edmonton. • Clark's career in politics began with a stint volunteering on the leadership bid of Alberta Conservative Alan Lazerte in 1958. Lazerte came in second. During the provincial election in 1959, Clark was the driver for the man who won, W.J.C. Kirby. • At university, Clark was vice-president of the Conservative Club and was editor of the campus newspaper. In 1960, he organized a student protest over the issue of inadequate student residences. • Clark was a prankster at university, once staging a mock murder at a major Edmonton intersection. As a crowd of unwitting spectators looked on, two actors jumped from a car and pretended to shoot another actor, who collapsed complete with ketchup "blood" on his chest. The "body" was loaded into a car and the witnesses were still shell-shocked when the police pulled up. Hours later, those involved ended the resulting media frenzy by admitting it was a hoax. • In 1961, after receiving his bachelor's degree in political science, Clark was offered a job with the Diefenbaker government in Ottawa. He wrote speeches and pamphlets, set up media interviews and organized conventions. • Clark entered law school at Dalhousie University in Halifax in the fall of 1962, and soon after that won the presidency of the national Progressive Conservative Student Federation. After a year, Clark switched law schools, moving across the country to the University of British Columbia. • In British Columbia, Clark worked for the province's Conservative leader, Davie Fulton. But it came at the cost of his law classes, and he later dropped out of law school. However, he scored the highest mark of all students in his constitutional law class. • In 1964 Clark returned to Edmonton, where he began a three-year program as a graduate student in political studies. He also continued his work for the Alberta Conservative party, which by 1965 was led by Peter Lougheed.